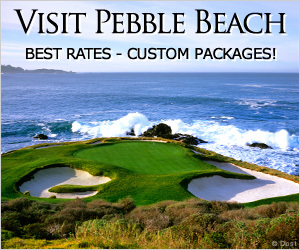 Pebble Beach Golf Links is rich in golf history. Set on one of the greatest meetings of land and sea in the world, there is not a more fitting host for the greatest championship on U.S. soil. Opening its fairways for play in 1919, Pebble Beach Golf Links has played host to 11 USGA championships, five of which where U.S. Open National championships. The following is a brief Tournament History of the U.S. Open at Pebble Beach Golf Links. Have you ever wondered what year Jack Nicklaus hit his famous 1 iron shot on 17 or when did Tiger Woods win by 15 strokes? This US Open timeline includes 1972, 1982, 1992, 2000 and 2010. The first U.S. Open championships at Pebble Beach was held in 1972 and was won by Jack Nicklaus who captured his 13th major title in historic fashion. Nicklaus arrived at the treacherous 209-yard 17th hole facing a stiff headwind. He hit, what turned out to be one of the most famous golf shots of all time, a perfect one-iron that struck the flagstick and stops five inches from the cup for a tap in birdie. In 1982, Pebble Beach played host to its second U.S. Open championship and it too was memorable. Jack Nicklaus and Tom Watson found themselves in a tie. With Nicklaus in the clubhouse, Watson steps to the 17th and hits his two-iron into the left rough. Starring at a bogey, Watson grabs his sand wedge, chops the ball into the air and watches as it landed on the green and proceeded to rolled into the hole for a birdie! This gave Watson a one shot lead heading into the final hole, which he also birdied to seal the two shot victory. Ten years later, in 1992, the final round was reminiscent of a fairytale windstorm. With forty-mile-per-hour coastal wind, Tom Kite battled the elements and played superbly. Chipping in on the par-three 7th solidified this lead and his first Major title. 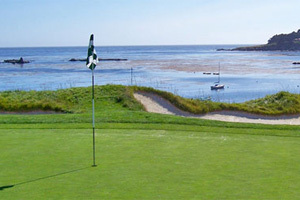 In 2000, Pebble Beach hosted the 100th U.S. Open. Going down in history as the greatest U.S. Open performance of all time, Tiger Woods leads from start to finish. With an opening round of 65, the best eighteen-hole total of any previous U.S. Opens played at Pebble Beach, Tiger completed the tournament with a four-day total of 272. This score tied the record for the lowest 72-hole score ever in the national championship and besting his nearest competitor by 15 strokes. 2010 proved to be an extremely tough test. 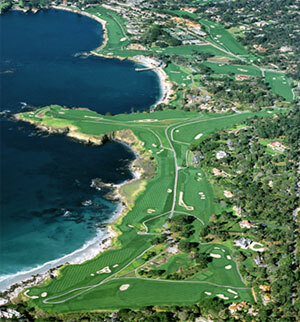 Pebble Beach could not have looked better, manicured to perfection while playing hard and fast. With steady play, it was 30-year-old Graeme McDowell claiming victory with rounds of 71-68-71-74. On Sunday McDowell found himself one stroke ahead of France's Gregory Havret, who was playing in his first U.S. Open, two clear of South Africa's Ernie Els, and three ahead of Tiger Woods and Phil Mickelson, who tied for fourth at 287. McDowell the native of Portrush peninsula in Northern Ireland become the first European winner of the championship since England's Tony Jacklin in 1970. The U.S. Open will return to Pebble Beach Golf Links in 2019 for a sixth time as part of the course's 100th anniversary celebration.